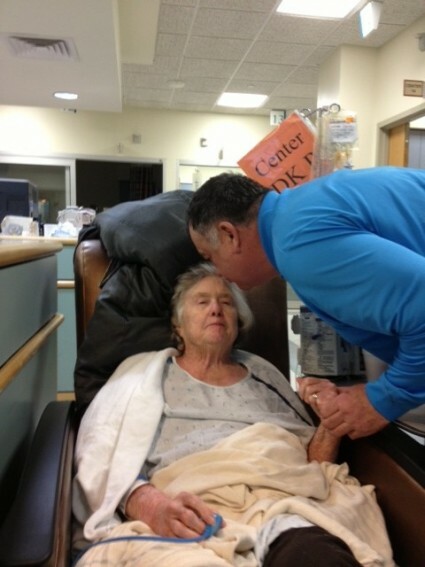 My mother in law Ginny Quinlan has been very ill in St. Mary’s Hospital in Newtown for the past week. She hasn’t been eating at all for weeks and we’ve been so worried. Today, my husband Joe walked into her room and she was eating a full breakfast. Amazed to see her enjoying food for the first time in months, he asked, “Where did you get it?” “I just ordered it up on the phone,” she answered. Joe looked at the phone, six feet away from her ‘guardrail bed’ and scratched his head. Later, he saw a woman cleaning the corridor. He had met her on Mom’s first day there and given her a copy of “The God Box.” Joe asked her, “Do you have any idea how my Mom got breakfast?” “Oh yes, I happened to be in her room when the phone rang so I answered and gave it to her and she asked for food.” To us, a little miracle. To my Mom-in-law, lifesaving. 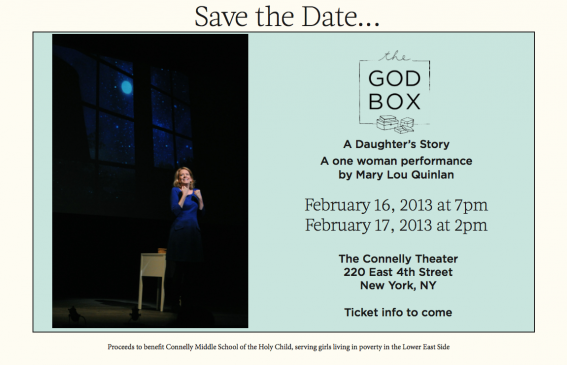 The God Box Performance in NYC! We will post information about reservations. In lieu of paid tickets, we will invite donations to support the girls and their devoted teachers. Stay tuned to the Events page on www.theGodBoxproject.com or write to me here for details.